Paw Print Genetics - Which Breeds are Affected by Degenerative Myelopathy? Degenerative myelopathy (DM) can be a devastating disease. Some breeds with this disease will lose the ability to walk in their later years – certainly after the age most dogs are bred. The mutation has been found in more than 70 breeds, which indicates that the original mutation might have occurred hundreds or thousands of years before many of the modern dog breeds emerged. However, the frequency of the mutation varies between breeds and certainly the risk of developing the clinical disease seems quite distinct and breed-specific. For example, the frequency of carriers and homozygous mutation (affected) dogs in the Kerry blue terrier is about 52%(1), while carriers and affected dogs make up 91% of Pembroke Welsh corgis in Japan (2). Although wire fox terriers have a similar combined carrier and at-risk frequency of 90%, none have ever developed the clinical signs of DM (3). 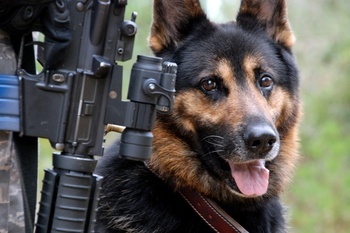 In a 2001 study by Moore et al., German shepherd dogs had nearly twice the risk for death associated with spinal cord diseases, compared with Belgian shepherd dogs among military dogs (4). Although we don’t know for sure if the spinal cord disease was DM, certainly DM is one of the more common causes of this type of disorder in GSD. Because GSD are used so frequently in the military and law enforcement, and these dogs are expensive to acquire and train, it is important to identify DM and other later on-set diseases prior to training. Why do some breeds develop the disease – have an abnormal phenotype – while others that carry the exact same mutation do not? There are several possible reasons for this – and I will tell you now, the actual reason is not known for most canine diseases. To discuss the variability in phenotype, we need some definitions. The term incomplete penetrance refers to whether the individual who has the mutation actually shows the disease. Penetrance is either all or none – they either have clinical signs or they don’t. Variable expressivity refers to individuals who are 100% penetrant (show the disease), but their clinical presentation is variable; for example, some are severely affected while others with the same mutation show milder clinical signs. Epistasis refers to the ability of a separate gene to mask or affect the expression of the gene you are interested in. Some literature will discuss modifiers or modifying genes. These would be examples of epistasis. In some cases, the phenotype or clinical presentation of a particular genotype is completely hidden because of epistasis. The first is differing genetic backgrounds. Just as different breeds look distinct from one another and can even behave differently, their genomes are slightly different. These slight differences allow researchers and companies to develop breed-identification tests but also are the driving force behind various traits we find in our breeds. The most extreme and obvious example are the short legs found in dachshunds, basset hounds and the short-legged terriers that is caused by a very specific insertion and concomitant duplication of a particular piece of DNA (5). This insertion causes the short leggedness; one can just look at a greyhound and know that they don’t carry this insertion in their DNA. There are many other known, and mostly unknown, changes in the DNA that humans have selected for that result in the desired traits that are the hallmark features of certain breeds. One or more of these genes may be masking the effects of the DM mutation, thus not allowing the dogs to manifest the disease through epistasis. Age of onset: Another possible reason for the penetrance differences between breeds – although for DM I am not convinced this is the reason – is age of onset. We know that DM is a late age of onset disease, meaning that dogs don’t show signs of the disease until later in life; some as early as 5 years old, while the mean age to show the disease is 8-9 years of age. Perhaps because some breeds live longer than others, this allows time for the disease to manifest. But this certainly doesn’t explain the lack of clinical symptoms in most at-risk wire fox terriers whose average life span is 12-15 years! Environment is another possible explanation for the observed incomplete penetrance variability between breeds. But for DM, in particular, this is unlikely to be the correct explanation. Environment doesn’t just refer to external surroundings, but it could be that the dog’s internal environment plays a role (and, of course, this would be genetic), such as metabolic rate, hormone levels or other measurable nuances. Given the incomplete penetrance, should DNA testing be performed in those dogs that rarely show clinical signs? This question can only be answered by the specific breed clubs for which DM mutations have been found. If it is not a concern for a specific breed club, certainly testing does not have to be performed, although some may test so that the genetic health of their dog is more complete. Could the prevalence of clinical disease (given a steady mutation rate in the population – so we are not talking popular sire syndrome here) change over time? Sure, it is conceivable that new genes could be introduced into a population through outbreeding, which might change the genetic background controlling specific differences between breeds and could introduce an epistatic gene that might mask or exacerbate the disorder. How can experiments be designed to address this problem? Well, you may not like my answer – but I am a geneticist! One possibility is to cross two dogs representing two breeds that are both homozygous mutant (at-risk), such as a German shepherd and a wire fox terrier to produce a (F1) generation that are all mutant/mutant, but have a mix of the two genetic backgrounds from these two distinct breeds, and watch the puppies for ~10 years to see if they develop the clinical signs of DM. The genomes of those that develop DM could be compared to the littermates who don’t have clinical signs of DM to find the genes that are modifying the presence or absence of disease (i.e. penetrance). You may get some funny looking dogs and, of course, there is the risk that all or none of your puppies develop DM, which would make your genome comparisons meaningless. Odds are, however, that the experiment would yield helpful insights into the mechanism of disease manifestation. But a 10-year experiment? Does seem like a long time. I am certainly open to suggestions on my experimental design! Is your breed club concerned about DM? Help us provide the testing options you desire. Review our website for diseases in your specific breed and then write to us at AskUs@pawprintgenetics.com. Tell us what you think! Chang HS, Kamishina H, Mizukami K, Momoi Y, Katayama M, Rahman MM, Uddin MM, Yabuki A, Kohyama M, Yamato O. Genotyping Assays for the Canine Degenerative Myelopathy-Associated c.118G>A (p.E40K) Mutation of the SOD1Gene Using Conventional and Real-Time PCR Methods: A High Prevalence in the Pembroke Welsh Corgi Breed in Japan. J Vet Med Sci. 2013 Jul 1;75(6):795-8. Epub 2013 Jan 18. Bell JS. Maneuvering the Maze of Genetic Tests: Interpretation and Utilization. Presented at the 5th Tufts’ Canine and Feline Breeding & Genetics Conference. Moore GE, Burkman KD, Carter MN, Peterson MR Causes of death or reasons for euthanasia in military working dogs: 927 cases (1993-1996). J Am Vet Med Assoc. 2001 Jul 15;219(2):209-14. Parker HG, VonHoldt BM, Quignon P, Margulies EH, Shao S, Mosher DS, Spady TC, Elkahloun A, Cargill M, Jones PG, Maslen CL, Acland GM, Sutter NB, Kuroki K, Bustamante CD, Wayne RK, Ostrander EA. An expressed fgf4 retrogene is associated with breed-defining chondrodysplasia in domestic dogs. Science. 2009. Aug 21;325(5943):995-8.